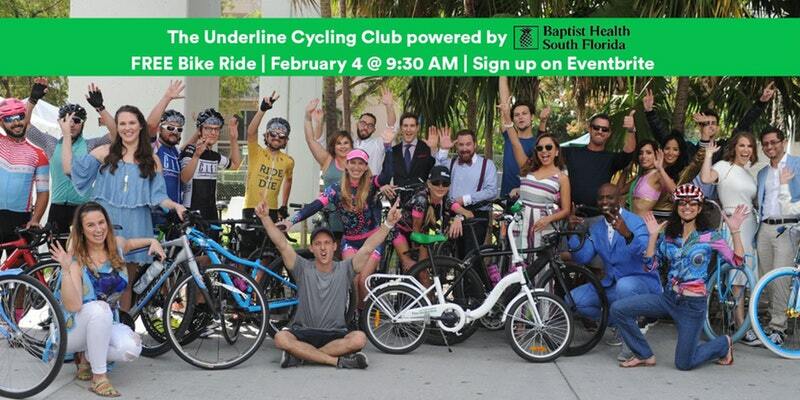 "On February 4th, join us for a Sunday fun day as we explore The Underline's connections to future and existing destinations in our beautiful city! Meet up at 9:30 AM at University Metrorail Station for a 10AM departure. We'll travel to our destination at Fairchild Tropical Botanic Garden for some snacks, refreshments, a free day at Fairchild and a special look into The Underline's future garden and plant selection by our expert partners at Fairchild! Feel free to join us on our ride back for a 13-mile round-trip ride. Cyclists of all levels are welcomed and are encouraged to arrive sporting their favorite football team jersey in the spirit of Super Bowl Sunday. Helmets are required for everyone.."
Special thanks to our Cycling Club sponsor Baptist Health South Florida and our bike ride host Allstate.